PeopleOfAr | To know wisdom and instruction; to perceive the words of understanding. To know wisdom and instruction; to perceive the words of understanding. Hey there! Thanks for dropping by PeopleOfAr! Take a look around and grab the RSS feed to stay updated. See you around! Starting 2015 with a NEW WEBSITE! I’ve noticed that my readers often only read the latest posts while the older posts rarely get any traffic (aside from a few popular once). They quickly get forgotten and burred under a pile of new posts on the front page. But rarely people navigate to the rest of the pages in order to dig through buried treasures of knowledge so to speak. In order to be able to present the content in a more appealing manner, I need to install plugins, change the design and even do some coding. But all of this is not permissible within the standard wordpress guidelines. There is a limit to what users are able to customize on a free wordpress.com blog. Therefore I need a self-hosted website with a personal domain over which I will have all control. So I’ve been pondering this for a while now, and finally decided to go ahead and move the blog to a self hosted domain. As it happens to be www.peopleofar.com was still available. With such a highly sought after domain name, it surely is nothing short of a miracle. 😉 No…, but all kidding aside, migrating to a new hosting provider comes with its own set of drawbacks. For example the impending loss of subscribers, regular visitors and the loss of the ever growing traffic that PeopleOfAr is blessed with. But all is not lost, as with a few precautionary steps it is possible to transfer all the subscribers and the traffic to a new self hosted WordPress.org website with little to no trouble at all. All links will still be operational and all posts will be accessible. If you’re also interesting in migrating your wordpress blog and would like more details, leave a comment and I’ll help you set it up. So without further ado I am happy to announce that I have set up a new website at www.peopleofar.com with improved navigation, design and most of all, I have all the freedom in the world to tweak and mold the website into a better platform for all readers. The new website is not yet perfect as some issues still need attention, but I am determined to improve on all of it over time. I am determined to improve the overall quality, quantity, and usability of PeopleOfAr. Of course all the suggestions are more than welcome. If you find bugs, or something bothering you, or any other suggestions feel free to contact me by leaving a comment or sending a personal email to peopleofar@hotmail.com. All the help is appreciated. Thanks to everyone who has been visiting and enjoying this blog so far. I find a lot of motivation and encouragement from all subscribers, visitors, and everyone else who appreciates the pursuit of truth, knowledge and academic integrity! PeopleOfAr is set to grow and improve in 2015, so make sure to visit the new website and subscribe (in the right column) if you haven’t already. If you are already subscribed to this blog your subscription will be automatically transferred to the new site. Thank you all, and see you all soon on the OTHER SIDE! In the spirit of holidays I would like to share an interesting article about the introduction of gingerbread in Europe. Eaten in England, Germany, the U.S., Romania and more Nordic countries than you can remember – the humble gingerbread has been a winter holiday favorite, accompanying other delicacies on tables for centuries, but always standing out thanks to a delicious combination of ginger, molasses or honey. So deeply rooted in Europe, it is perhaps odd, yet also delightful, that it was actually an Armenian monk who introduced the sweet, dark confection to the continent over one thousand years ago. It was the year 991, when archbishop Gregory Markar traveled from Nicopolis, a city in the ancient kingdom of Pontus now located in modern day Anatolia, Turkey, after being chased out by the Persian Army. Tired and weary, he made his way across Europe, arriving in the Gâtinais, part of the Loire Valley region in France. With permission from local officials, Gregory became a hermit, choosing to live close to the Saint Martin-le-Seul church in Baudrevilliers, which was previously abandoned by Vertou monks. The Discovery Channel posted today an interesting “photo of the day” on their Facebook page. 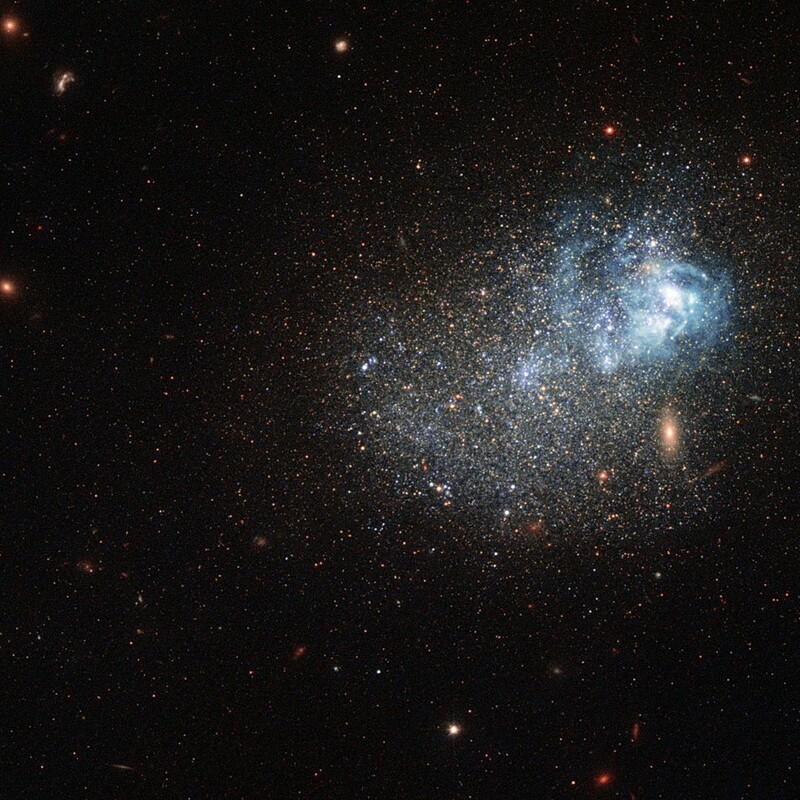 It’s a picture as seen by the Hubble telescope of a galaxy known as the Markarian 209. Now why does a galaxy have such an Armenian name? Let’s examine. Markarian 209 is a part of a whole group of bright Markarian Galaxies. They belong to a class of galaxies with a bright center that radiates an excessive amounts of ultraviolet. They are named after their discoverer, a renown Armenian astrophysicist Beniamin Markarian (1913-1985) who in 1965 first discovered these galaxies at Byurakan Astrophysical Observatory in Armenia. 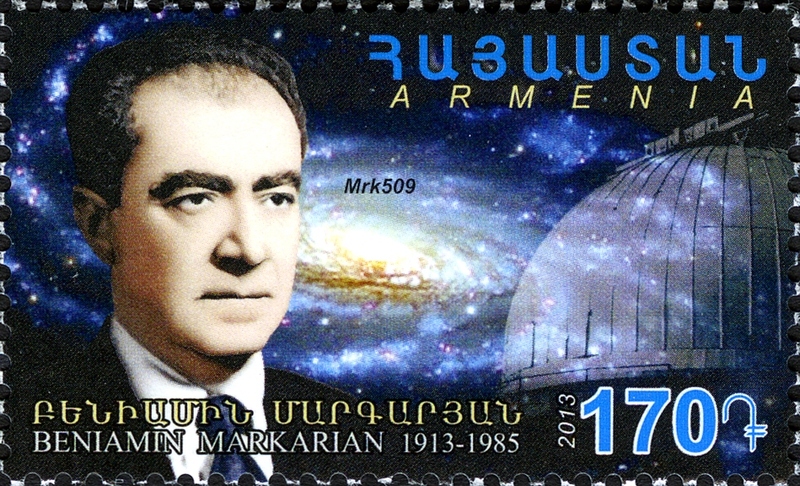 Beniamin Markarian was considered one of the greatest observing astronomers of the 20th century. He worked at the Byurakan Observatory since 1946 on theories of star-formation, clusters and super-clusters. He studied star associations and published the first systematic catalog of OB associations. For his work in 1950 he was awarded the prestigious Soviet Stalin Prize along with his colleague Victor Ambartsumian. He went on to discover the Markarian Galaxies in the 1960s and published a catalog of 1469 galaxies called Markarian catalog (First Byurakan Catalogue of Markarian galaxies). Markarian also discovered a string of galaxies moving with a common motion. Named after him the Markarian’s Chain is a stretch of galaxies that are part of the Virgo Cluster. It is called a chain because, when viewed from Earth, the galaxies lie along a smoothly curved line. Markarian has received many honors during the course of his career. Between 1965 and 1989 up to 1515 Markarian Galaxies have been identified by the First Byurakan Survey. In 2005, the Second Byurakan Survey was carried out, extending the survey to fainter objects, making a catalog of total 3563 objects, 1863 of which are galaxies and 1700 stars. A perfectly preserved shoe, 1,000 years older than the Great Pyramid of Giza in Egypt and 400 years older than Stonehenge in the UK, has been found in a cave in Armenia. The 5,500 year old shoe, the oldest leather shoe in the world, is made from a single piece of cowhide, cut into two layers, tanned and laced. 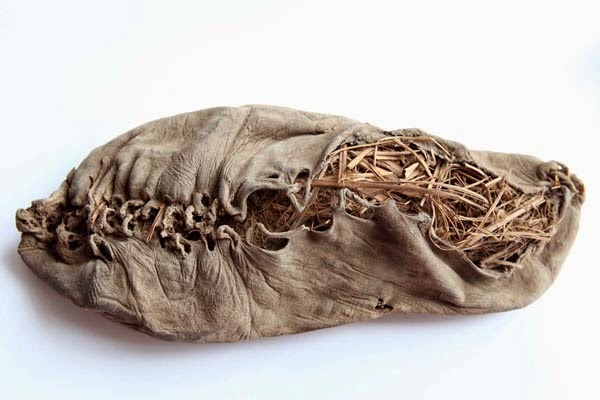 It contained grass, although the archaeologists were uncertain as to whether this was to keep the foot warm or to maintain the shape of the shoe. “It is not known whether the shoe belonged to a man or woman,” said lead author of the research “We thought initially that the shoe and other objects were about 600-700 years old because they were in such good condition,” said Dr Pinhasi. “It was only when the material was dated by the two radiocarbon laboratories in Oxford, UK, and in California, US that we realised that the shoe was older by a few hundred years than the shoes worn by Ötzi, the Iceman.” Three samples were taken in order to determine the absolute age of the shoe and all three tests produced the same results. Interestingly enough the shoe very much resembles a traditional Armenian shoe known as “charokh” a type of moccasin, still in popular use in Armenia. 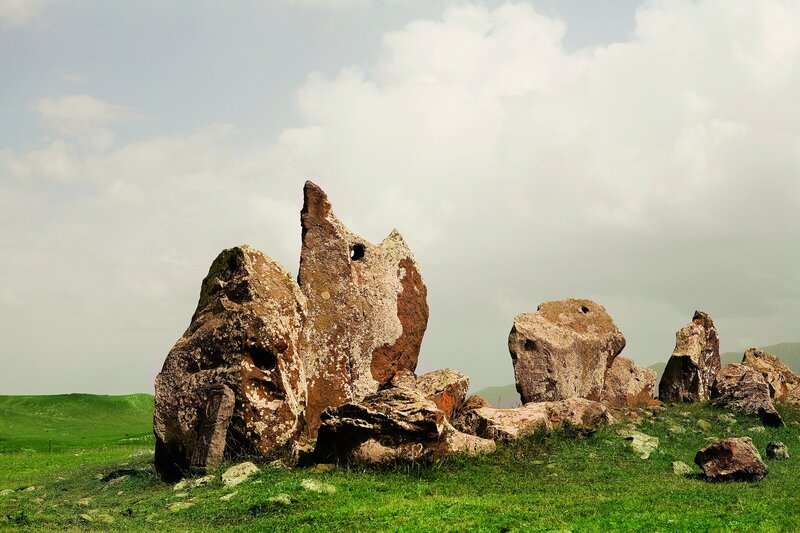 “Carahunge” or “Zorats Karer” (also known as the Armenian Stonehenge) is a megalithic stone circle located some 200km from the Armenian capital Yerevan, not far from the town of Sisian. 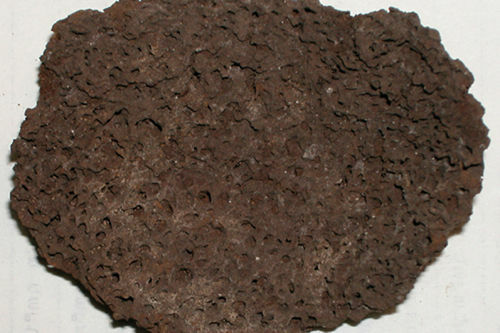 The name derives from “Car” for “stone” and “hunge” for “sound” or “voice”, meaning “singing stones”. The structure is believed to be a sky observatory due to the enigmatic holes drilled in the stone pointing at the cosmic bodies like the sun, the moon and the stars. It is specifically aligned with the Cygnus constellation and its brightest star Deneb. Being over 2000 years older than the Stonehenge it is believed to be the oldest known sky observatory. However, only since the middle of the 80ies, Carahunge was first interpreted as an archaeoastronomical monument and was studied by Prof. E.S. Parsamian (1999) and Prof. P.M. Herouni (1998) who have dated the structure to around 5,500 BCE. There are 222 stones with a total extent exceeding 250 metres, including 84 with holes (with 4-5 cm diameters). In a cave overlooking southeastern Armenia’s Arpa River a team of international scientists have uncovered three Copper Age human skulls, each buried in a separate chamber. The skulls belonged to 12- to 14-year-old girls. The team in Armenia, comprised of 26 specialists from Ireland, the United States and Armenia, had been excavating the three-chamber cave where the brain was found since 2007. “The preliminary results of the laboratory analysis prove this is the oldest of the human brains so far discovered in the world,” said Dr. Boris Gasparian, one of the excavation’s leaders and an archeologist from the National Academy of Science’s Institute of Archaeology and Ethnology in Yerevan. “Of course, the mummies of Pharaonic Egypt did contain brains, but this one is older than the Egyptian ones by about 1,000 to 1,200 years.” The cave’s damp climate helped preserve red and white blood cells in the brain remains. Genetic research is underway. Documentary on Turkey’s hidden Armenians “Turkey, the Legacy of Silence”, to be released on the web on April 2015 (centennial of the Armenian Genocide). 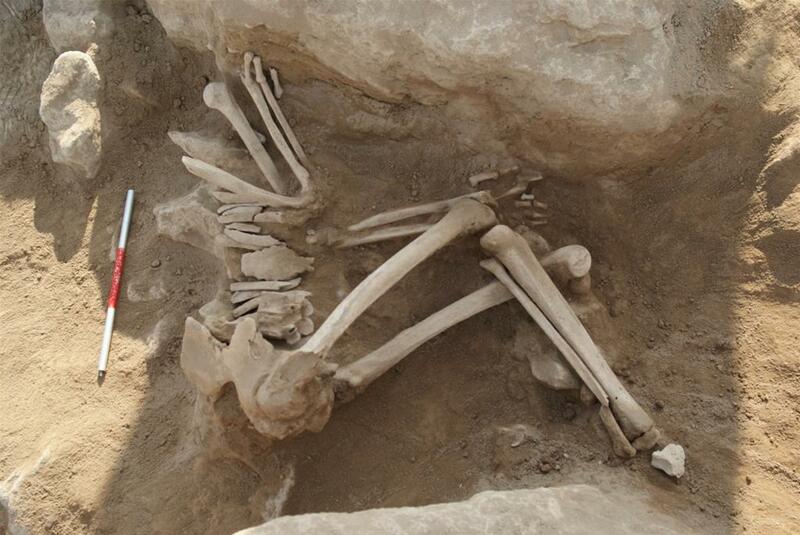 Archaeologists from the University of Warsaw (Institute of Archaeology) discovered evidence of destruction and capture of the ancient city of Metsamor, one of the most famous archaeological sites in Armenia. Metsamor was essentially a Bronze Age city that at its heyday (from the 4th to the 2nd millennium BCE) occupied more than 10 hectares of land and was surrounded by walls made of huge stones, often weighing several tons each. The central part of the fortress was surrounded by temple complexes with seven shrines. It was an important early center of metallurgy on an industrial scale, religious worship and sky observation. No this is not a supermodel, this lovely lady Vera Hovhannisian has won a gold medal and the world cup at the Culinary World Cup 2014 held in Luxemburg from Nov. 22 to 26. The competition featured more than 1,000 cooks from 60 countries, as well as 105 national, regional, and youth teams. Vera Hovhannisian’s twin sister Rena also jointed her in the competitions. The sisters presented two works at the contest and both won gold medals. Hovhannisian has won a number of international competitions. At the age of 20 she received her first gold medal in Malta. She’s particularly well-known for her unique cakes. On Wednesday 26 November, the Plurinational Legislative Assembly of Bolivia unanimously passed a resolution in solidarity with the claims of the Armenian people and condemning “all denialist policy regarding the genocideand crimes against humanity suffered by the Armenian nation,” Prensa Armenia reports. Speaking to Prensa Armenia, Senator Zonia Guardia Melgar, acting chairperson of the Senate of Bolivia, explained that “the camaral statement was taken unanimously by both the Senate and the Chamber of Deputies, with the approval of the Foreign Ministry”. “We offer our full support, solidarity and comradeship to the Armenian people and the Kurdish people, because our State Constitution, which is the law of laws, says no to discrimination, violation of human rights and genocide” she added. “The Plurinational Legislative Assembly of Bolivia shares and is in solidarity with the Armenian people for the fight of their claims, the preservation of human rights, and the establishment of truth and justice. Armenian flatbread, otherwise known as lavash has been inscribed on UNESCO’s Representative List of the Intangible Cultural Heritage of Humanity. Armenia’s Foreign Ministry announced that the “preparation, meaning and appearance of traditional bread as an expression of culture in Armenia” had been included in the list during the 9th Session of the intergovernmental committee of UNESCO’s Convention for the Protection of Intangible Cultural Heritage in Paris on November 26. Lavash is a traditional thin bread that forms an integral part of Armenian cuisine. Its preparation is typically undertaken by a small group of women, and requires great effort, coordination, experience and special skills. A simple dough made of wheat flour and water is kneaded and formed into balls, which are then rolled into thin layers and stretched over a special oval cushion that is then slapped against the wall of a traditional conical clay oven. After thirty seconds to a minute, the baked bread is pulled from the oven wall. Lavash is commonly served rolled around local cheeses, greens or meats, and can be preserved for up to six months. It plays a ritual role in weddings, where it is placed on the shoulders of newlyweds to bring fertility and prosperity. The group work in baking lavash strengthens family, community and social ties. Young girls usually act as aides in the process, gradually becoming more involved as they gain experience. Men are also involved through the practices of making cushions and building ovens, and pass on their skills to students and apprentices as a necessary step in preserving the vitality and viability of lavash making. 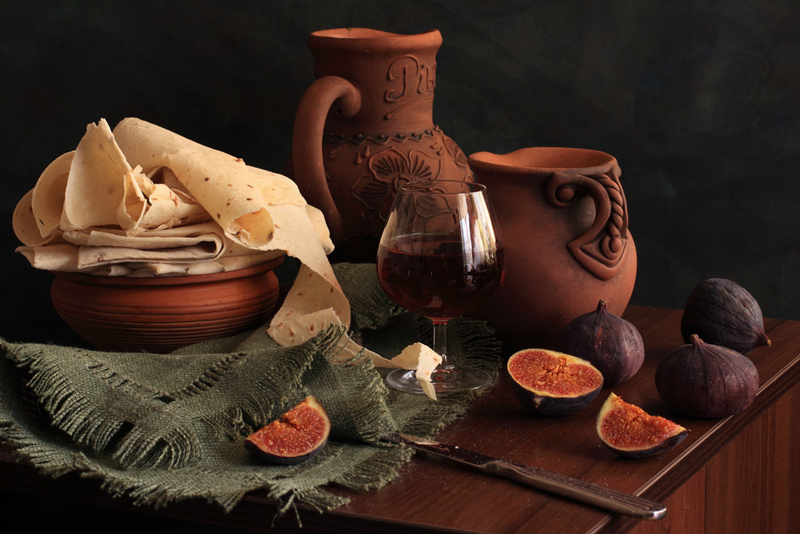 Armenian lavash has been prepared in the same way for thousands of years. Archaeologists in Armenia have uncovered ancient fire pits all strikingly similar to the tvonir ovens that are still used to bake lavash. The discovery of a large 3000 year old archaeological settlement in Eastern Turkey has been widely reported in Turkish media, last year. The news has reached international audiences through the English translations from sources such as the Worldbulletin. An archaeological settlement dating back to 3,000 years ago was discovered in eastern Tunceli province of Turkey. Thanks to the efforts of Turkish researcher Serkan Erdogan from Faculty of Science and Letters of Bitlis Eren University, and Culture and Tourism Director of Tunceli Ismet Hakan Ulasoglu, a 3,000-year-old settlement near Rabat hamlet of Cemceli village was discovered. Being the largest archaeological settlemet of Tunceli, a citadel-like settlement containing overtones of early iron age, Urartian, Hellenistic, Roman, Byzantium period, Islamic middle age and Ottoman era was predicted to be one of the most important centres situated at an old transportation network. Having encountered iron dross, ceramics, historical bridge and weight objects, researcher Erdogan thought that the area in question was an important economic production centre in different eras of the history. Erdogan said that the discovered citadel was wider than three football stadiums. 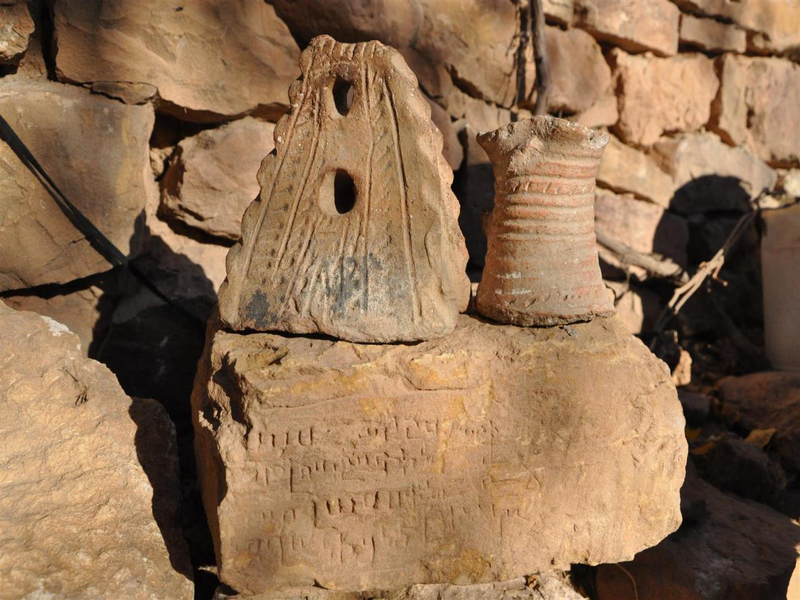 What the report doesn’t mention however, is that there are clearly visible old Armenian texts (as is seen in the picture above) inscribed on the ancient stones found at the sight. Whether the Turkish researchers are aware of this or not remains a mystery. Nevertheless the Armenian traces are undeniable. Tunceli province (formerly Dersim Province) was historically part of the Greater Armenian region of Sophene (Tsopk). Later it was annexed to the Byzantine empire and eventually occupied by the Seljuk Turks. Nonetheless the Armenian population remained thriving up until the first world war. After the tragic events of the Armenian Genocide most of the Armenian population has vanished from Eastern Turkey including Dersim Province. Today it is largely populated by the majority Alevi Zaza Kurdish and Sunni Turkish people. Yet the Armenian traces are still found among the ruins of the ancient stones. 13-year-old Sam Sevian completed the final requirement to earn the title of Grandmaster, the highest title a chess player can attain. He is now the youngest American Grandmaster in history. Sevian, who lives in Boston, had already completed his three “norms”, or superior performances in high-level tournaments, required by FIDE, the World Chess Federation. He just needed to top a strength rating of 2500 to earn the Grandmaster title. He was just 16 points shy of the mark when he arrived in St. Louis Friday to compete in the CCSCSL Invitational. Sam went on to win the Championship and earned the title of Grandmaster. Once you earn Grandmaster status, you have it for life. Armenia, a country in South Caucasus with a population of just three million, is a chess powerhouse. Chess holds an important place in Armenian culture that has produced some of world’s leading chess superstars like Tigran Petrosian, Levon Aronian, Rafael Vaganian, Vladimir Akopian and of course one of the greatest Chess players of all time Garry Kasparov. Armenia has produced more than 30 grandmasters and won the team chess Olympiads in 2006, 2008 and 2012. Armenian champion Levon Aronian is currently the third-best player in the world, according to the World Chess Federation rankings. In Armenia, learning to play the grand game of strategy in school is mandatory for children – the only country in the world that makes chess compulsory. Media outlets across the world have noticed Armenian achievements in Chess. BBC has named Armenia the “Cleverest nation on earth“, Al Jazeera reports on “Chess mania” in Armenia and Vice describes: “Why Armenia Is More Likely to Engineer Super-Children Than China“. 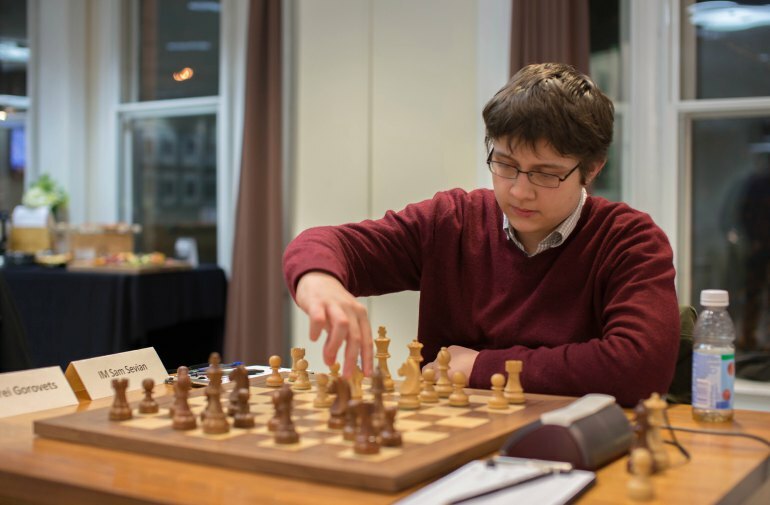 By becoming the youngest American chess grandmaster, Sam Sevian is continuing an old and proud Armenian tradition of Chess playing. We congratulate Sam on his victory and the attainment of his title and hope to see from him countless success in the future!